ZUM - probably the world’s greatest band! 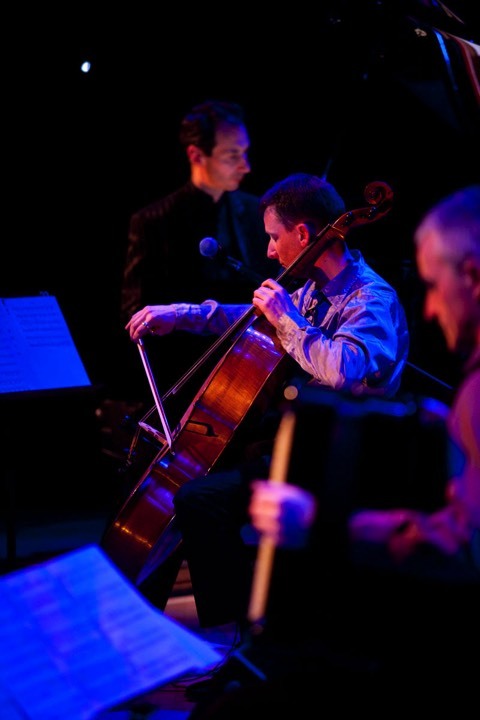 We began performing ‘Nuevo Tango’ masterpieces by Astor Piazzolla and music with hot-blooded passion from the golden era of tango, alongside the fire and brilliance of virtuoso Eastern European gypsy fiddle music. We’ve come along way since our beginnings. Our ground-breaking world fusion embraces the fact that it grew from the diasporan melting pot of cosmopolitan London. We weave melodies from around the globe, be it Celtic laments or hot-blooded Arabic melodies, grooving salsa or hard-hitting bebop: we use jazz to seamlessly interweave this wonderful music in our desire to create an exhilarating musical journey. With heart-stopping beauty and unbuttoned passion and explosive rhythmic power, our aim is to fuse these folk music traditions from around the world and, in the process, redefine world music. 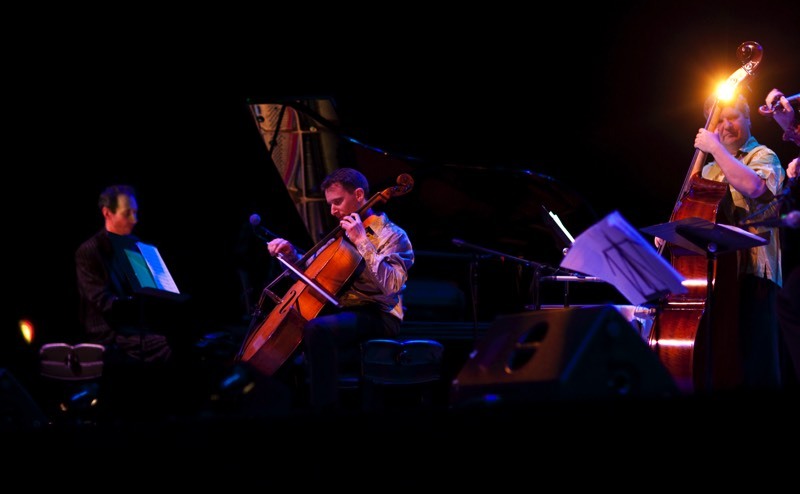 ZUM is the brainchild of cellist, Chris Grist. 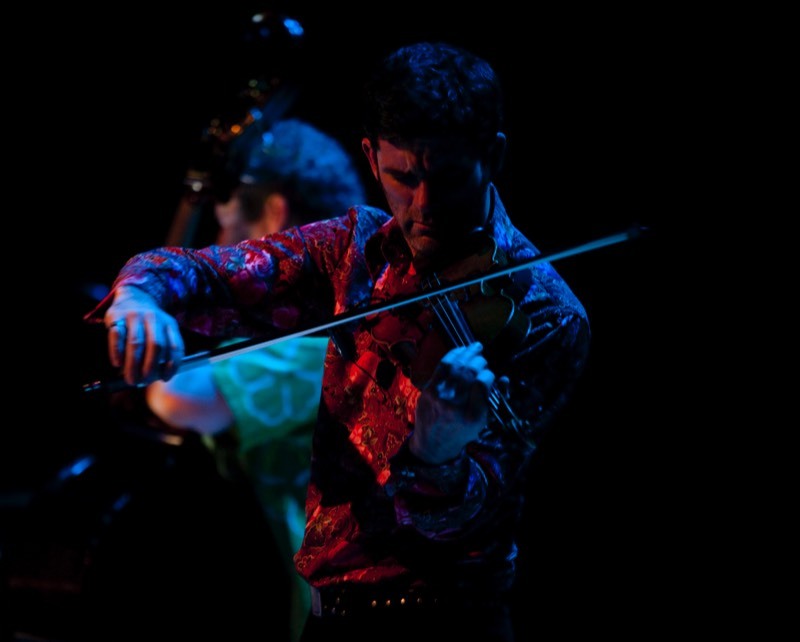 Chris came up with the idea late in 2000 after firstly having been introduced to the genius of Astor Piazzolla (through the music of US guitarist, Al di Meola) and then on hearing a gig at Ronnie Scotts in London of the renowned Hungarian gypsy violinist, Roby Lakatos. Unable to get the two strands out of his head, he came up with the idea of fusing the two to create a completely new genre, Gypsy Tango. Chris called up pianist, Dave Gordon, and violinist, Adam Summerhayes to discuss the project with them. He arranged a meeting to which Chris was 2 hours late, Adam didn't show up and Dave said he wouldn't have any time to write the music – it was destined to be a sure-fire hit! Eventually Dave and Adam did get together, wrote and arranged the music and ZUM was born....or at least a band with no name was born, and it stayed that way for 18 months! After some truly appalling brain-storming sessions trying to find a name, someone suggested ZUM, after a piece by Astor Piazzolla that we particularly enjoyed playing. It seemed to sum up everything about us, so ZUM we are. It transpired that the project was a natural meeting of musical worlds - both halves of the music originated from poor beginnings; the gypsy from the back streets of Eastern Europe and the tango from the ‘bordellos’ of South America - and both subsequently went on to be embraced by the concert halls of the West, admired for the sheer beauty and soulfulness of the music. Not only did the music all originate long ago from the same place (gypsies who took different routes across Europe, some ending up in eastern Europe, the others heading to Spain where émigrés then took Spanish music to the Americas where it became tango), but these two folk-music styles then grew independently in parallel from opposite sides of the Atlantic, using almost identical instruments. Our journey has not just been a musical one, but also a physical one. We’ve had 15 years together on the road, and had the extraordinary privilege of playing in some amazing buildings, settings, countries, and to some fabulous audiences. We’ve played to sell-out crowds at the Southbank Centre, performed in working men’s clubs in Cardiff, Cathedrals all over the country, Ronnie Scotts Jazz Club, for music societies, at festivals, in theatres, in dark and dingy clubs. We’ve had some truly stand-out amazing experiences (and some equally stand-out, but perhaps not so amazing!). As well as performances in the UK, we’ve had some wonderful trips to some extraordinary places along the way. We’ve been invited to perform by Northern Finnish lakes in the middle of summer, Northern Alaskan towns in the middle of winter, driven from gig to gig across the Saudi Arabian desert, performed in stunning barns in the Loire Valley, in amazing palaces in Croatia, in school halls in the Mid-West of America, in tiny radio studios in Helsinki, in an autumnal Rockies scene in Montana, and too many more to mention here. Each amazing experience has been indelibly etched on our collective memory, informed our music, inspired us in so many ways and hopefully made us better musicians and a better band. It’s been an inspiring journey.